Have you already signed up to reserve the new Samsung Galaxy Note9? 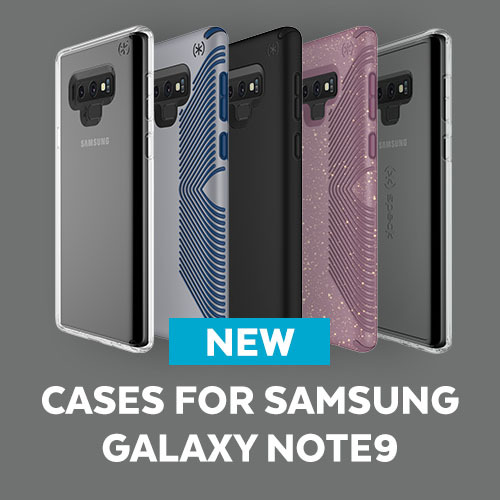 If so, we have great news: Speck’s Note9 cases are available to purchase now! Available cases include the Presidio GRIPⓇ and the new dual-layer PresidioⓇ STAY CLEAR . PresidioⓇ STAY CLEAR is designed to protect against both UV rays and oil absorption. With a case that stays clearer, longer, you can be sure that your phone will always be dressed to impress while being protected against drops up to 8 feet. What has Samsung upgraded with the new Note9? Samsung’s new device features a bigger screen as well as major upgrades to both battery life and storage capacity. And for all you game lovers, this device is now compatible with the wildly popular game: Fortnite. The Samsung S Pen, the key companion of Note9, also got a makeover. S Pen now incorporates Bluetooth transforming it into the ultimate remote control. The dynamic duo will be available in a variety of color combinations. The Note9 is equipped with a battery that should last you all day, packing a 4,000mAh cell. The base model of the Note9 holds 128GB of memory, but you also have the opportunity to upgrade to a 512GB version. This version, combined with a 512GB microSD card, will support 1TB of memory. That’s more storage than the average laptop! The Note9 has two 12-megapixel cameras that come with image stabilization, and a new Scene Optimizer mode to analyze the subject of the picture and identify up 20 different scenarios including food, pets, urban landscapes, etc. The Note9 will also automatically detect and notify you if your picture is blurry, if someone blinked, or the lighting was off. The evolved S Pen now incorporates BluetoothⓇ, allowing the stylus to be used as “the ultimate remote control.” You can use it to control the camera shutter, present slideshows, and play or pause your music. Now, you can connect your Note9 to any monitor with and HDMI cord for access to the DeX software. This allows you to use the Note9’s screen as a trackpad or a remote keyboard. Looking to show off the Note9’s sleek copper or trendy violet colors? Protect your new device with Speck’s dual-layer Presidio STAY CLEAR case. Need an extra strong hold on your new phone? Speck’s Presidio GRIP with raised ridges provides a no-slip grip for a secure hold. While you’ll have to wait until August 24 to get your new Note9, you can buy a Speck case now and be ready to show it off when it arrives!